A pack of free vector Wedding Icons. These hand drawn wedding icons are perfect for wedding template designers. Looking for free social media icons? Connecting to social media platforms is a very important part for increasing a website’s popularity. In this roundup we have brought to you a list of free social media icons sets. Today we are presenting a very useful set of 36 Free Free SEO Icons which you can freely add to your icons library. 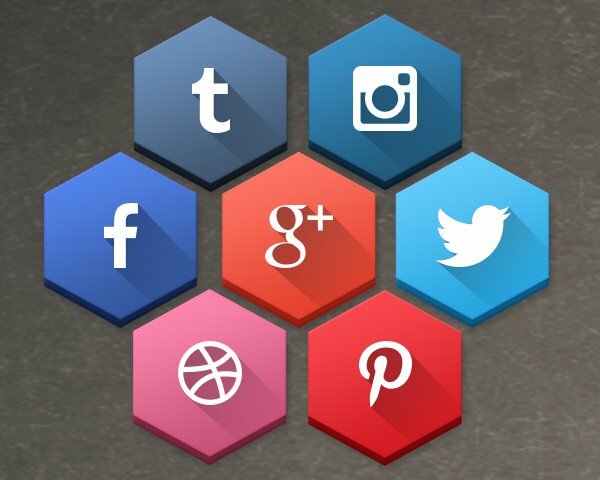 This freebie include 40 Free Hexagonal Long Shadow Social Media Icons. This is a lighter version of our previous freebie. The icons are neatly arranged in a PSD file which can be scaled easily to any size. The icons are free for personal and commercial usage. These long shadow icons will give an unique look to your website or blog. This freebie include icons for Addvocate, Android, Amazon, Apple, Digg, Dropbox, Four Square, Facebook, RSS, Google Plus, Google Drive, Paypal, Picasa, Sharing, Stack Overflow, Windows, Yelp, Zerply, Twitter, Youtube, Wordpress, Tumblr, Stumbleupon, Skype, Reddit, Pinterest, Myspace, Linkedin, Lastfm, Instagram, Github, Forrst, Flickr, Vine, Evernote, Vimeo, Dribbble, Deviantart, Blogger, Behance. This freebie include 40 Free Hexagonal Long Shadow Social Media Icons. The icons are neatly arranged in a PSD file which can be scaled easily to any size. The icons are free for personal and commercial usage. These long shadow icons will give an unique look to your website or blog. This freebie include 25 Free Long Shadow Social Icons. The icons are neatly arranged in a PSD file which can be scaled easily to any size. We have also included PNG images. The icons are free for personal and commercial usage. These long shadow icons will enhance the appearance of you website. This freebie include icons for Facebook, RSS, Google Plus, Twitter, Youtube, Wordpress, Tumblr, Stumbleupon, Skype, Reddit, Pinterest, Myspace, Linkedin, Lastfm, Instagram, Github, Forrst, Flickr, Vine, Evernote, Vimeo, Dribbble, Deviantart, Blogger, Behance. Usage : These icons are free to use in both personal and commercial projects. Linking back to us is not required but it is always appreciated as it will help to spread the word about us. If you want to share this freebie then you can do so by making a link to the freebie’s main page (this page). You cannot directly link to the download page.